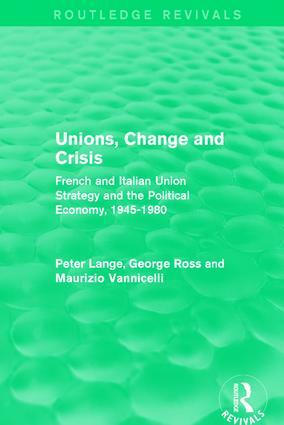 First published in 1982, Unions, Change and Crisis represents the first detailed, comparative, historical and theoretically grounded study of two of the major trade union movements of Europe. It brings together the results of the first part of the first major study from Harvard University’s Centre for European Studies. The book explores, first individually and then comparatively, the evolution of the French and Italian Union movements through the end of the 1970s. It will be of particular interest for students of trade unions, industrial relations and political economy in France and Italy, but also those interested in the comparative analysis of advanced industrial democracies more generally. The volumes in this set report and analyse European trade union responses to contemporary economic crisis. They emerged from a study at the Harvard Center for European Studies. The set will be of interest to those studying trade unions, industrial relations and European political economy.